A suburban town along Lake Champlain, South Burlington is home to 16,000 residents. GE Healthcare is South Burlington's largest employer while Ben and Jerry's also calls South Burlington home. The Recreation and Parks Department of South Burlington offers a variety of courses including free computer workshops, dog training classes, yoga and Zumba programs, and recreation opportunities for all ages. There are four community parks, 3 neighborhood parks, and a 20-mile recreation path. The South Burlington Community Library is also a popular place for programs, including book clubs and knitting classes. The South Burlington School District runs 6 schools in the community, but there are several other private schools as well. The median sales price in South Burlington was $359,500 in 2016 and is now $400,000 in 2017. An increase of 11.3%. 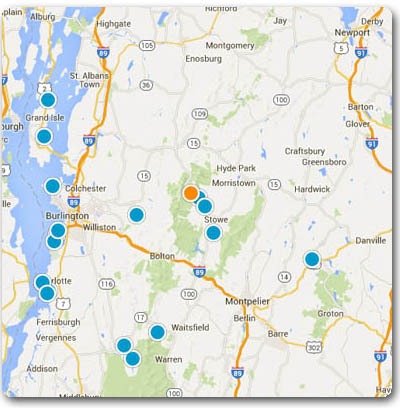 GreaterBurlingtonHomes map search includes all of the South Burlington VT homes for sale and South Burlington real estate. The pages search bar also features South Burlington VT condos and townhouses.